From the Heavy's football helmet to the Demoman's 'fro, classic TF2 hats will soon vanish from the store. 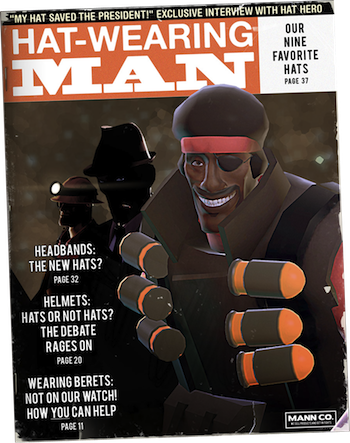 In 2009, Team Fortress 2 introduced the world to fashionable headgear as part of the Spy vs Sniper update. After that, the game eventually shifted to being entirely hat-funded, with the hat count balloning up to 268 at last count. Now, the original nine hats that started it all will be retired in two weeks. After all, what's a hat-conomy without scarcity? The list of retired hats list includes: Batter's Helmet, Soldier's Stash, Pyro's Beanie, Demoman's Fro, Football Helmet, Mining Light, Prussian Pickelhauge, Trophy Belt, and Fancy Fedora. Though still tradable, these hats will no longer drop or be craftable. An exception includes older crates which still might drop these classic scalp-scarves. The official TF2 blog explains that the reason for the retirement involves pallets of spoiled mayonnaise and raccoon feces, suggesting that Valve had better find a new cloud hosting provider soon. However, Valve also has an economist among their ranks, which might have something to do with it. Right now, TF2 could use the strong, guiding hand of the Ben Bernanke of Beanies to guide them through this troubled time.